This fender step pad is ideal for the do-it-yourselfer. 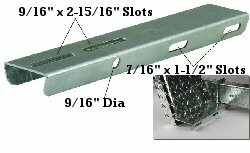 Step pad can be welded or bolted to your trailer fender. Step pad can also be bolted to your trailer frame with u-bolts. U-bolts not included.